I remember nothing else about the day – but this I do remember: I came home and the November 1997 issue of Gourmet was in the mail. I leafed through, as I often do, looking at the photos before a more (hopefully) thorough reading later on. I was instantly captivated by this humble little five ingredient cake. I made it that night, and many, many times since. Too many times to count. This is “our” cake. 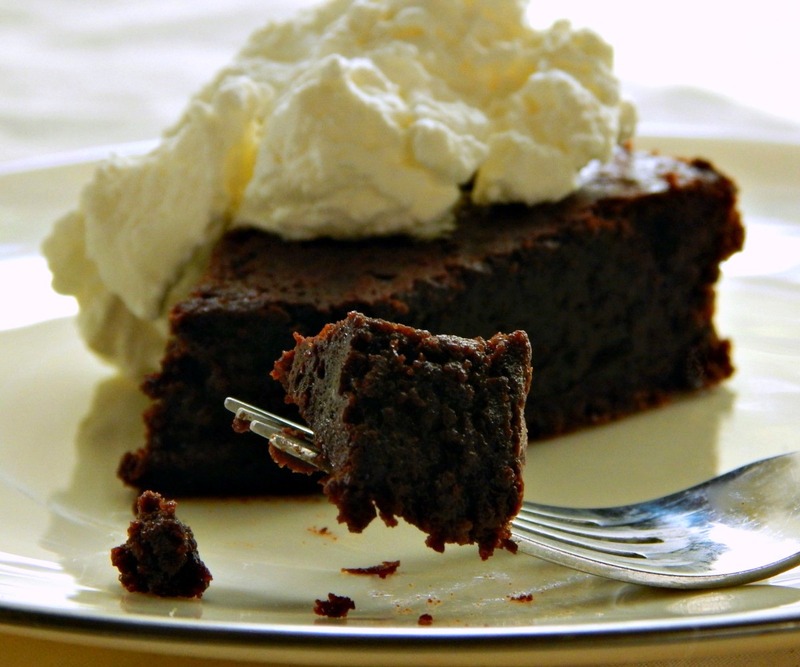 Inner Sanctum Chocolate Cake – so ridiculously homely, so delicious! I’ve made it with expensive “good” chocolate, bakers chocolate and chocolate chips. I’ve made it with plain old cocoa powder, Dutch processed and a mix of both. I’ve tweaked it a bit now and then with a half teaspoon of espresso powder, a little vanilla or both, and even on occasion thrown in a touch of Grand Marnier or a bit of raspberry liquor. I’ve over baked it (a bit harsh but still good,) baked it just right (a little more like a brownie) and slightly under baked it – the bomb! None of that matters. This cake is always good, and always easy. And it delivers on just what is required: pure, unadulterated chocolate flavor. As a matter of fact, serve milk, serve a slightly softened vanilla ice-cream or a lightly whipped cream – you know just the kind, I’m sure, a whipped cream that just isn’t quite to a stiff peak. One that settles with a sigh and melts into the cake. Perfection. That’s this cake – you will need milk or milk products! Sprinkle on a bit of powdered sugar or cocoa if you’d like – it won’t disguise the down right homeliness of the cake. Dress it up, perhaps by nestling it into a silky bed of creme anglaise or raspberry coulis. But don’t expect miracles. This is a Velma of a cake, one that delivers, a workhorse of pure flavor, not a Daphne, just there to dress up the scene. This is the cake I serve to family, to friends over for a casual dinner, to those that have no need to be impressed with mere looks. This is not the cake I bring to gatherings, where looks and good behavior matter, sometimes more than taste. This is the dirty little secret cake, the closet cake. It’s a little homely, a little gooey. It’s the cake whipped up at a moment’s notice and served to those who are lucky enough to happen to be a part of our inner sanctum. Do not underestimate this cake.Do not judge on looks, presentation, nor the simplicity of preparation.This is one of the best Chocolate Cakes you will ever eat. This cake takes five minutes to mix up, 20 – 25 minutes to bake and uses ingredients most people have hanging around. Although rather smallish (eight inch diameter) this cake will easily serve six to eight people. It is that rich. Talk about a great value for your chocolate…ah, er, money. So, after all this, I hope you’ll try it and enjoy it as much as we do! I’ve written the recipe with the adaptations I’ve learned as I’ve made this, my notes in parentheses. The important thing, here? Keep it simple, as it is supposed to be – don’t over think this little cake. Don’t pull out the kitchen aide; just stir it together and bake it. Look for baking goods & whipping cream to be on sale around just about any holiday, especially Easter and the winter triad – Thanksgiving, Christmas and New Years. Buy extra butter whenever it’s on sale and chuck it in the freezer where it will stay perfectly for months! Preheat oven to 375°F and butter or spray an 8-inch round baking pan. Line bottom with a round of wax paper and butter or spray paper. Make sure sides of pan are well greased. Add a tablespoon of cocoa to pan and shake and turn, making sure to cover well. Turn pan upside down over sink and gently tap to knock off excess. Chop chocolate into small pieces. In a medium sized or larger, microwave safe bowl, melt chocolate with butter, stirring after one minute, and then in 30 second intervals until chocolate is just melted. Stir until smooth. Cool cake in pan on a rack 5 minutes and invert onto a serving plate. Peel off parchment. To achieve what I think is the perfect texture, meaning it still holds together and can be sliced cleanly but is still very moist and slightly fudgey, bake for about 22 minutes, remove, let cool in pan about 10 minutes and then invert. Let cool to room temperature. If you wish to have a rather soft cake with an ooey, gooey pudding like texture inside, bake for 20 minutes, until the crust has formed, perhaps with only one or two very slight cracks, and has pulled away from the sides of the pan. It should be a little puffed, the edges firm and feel a just bit firm to the touch but not jiggly. Do not turn out until cake has cooled considerably longer, about 20 minutes. Run a knife around the outside, place a flat plate over the cake and invert. A flat plate means the cake has less distance to drop and less chance it will blow out on the sides. Wait another few minutes for it to set up (slightly warm is fine) and slice with a long knife, in one motion, straight down. The longer the cake cools, the firmer the texture. Oven temperatures can vary. Take notes from your first bake and you’ll have a better idea of how long you wish to bake it to get your perfect texture. I like this cake so much I often cut out multiple rounds of parchment when I make it, just to make it easier next time – I’m lazy and hate cutting out parchment rounds! From other bloggers and comments, this cake can be doubled and baked in a 9″ spring form pan. It seems it will still only need to be baked for about 25 minutes, but will (my guess) need to be cooled a bit longer before it is able to be cut. I’ll be posting this little recipe on two link parties; a link party is a weekly posting where bloggers from all over “bring” a dish. They’re great places to see a roundup of recipes from various bloggers all in one place. I’m reposting this recipe (it was one of my early blog posts) with additions and new photos and bringing this cake to Fiesta Friday 90 put on by Angie of the Novice Gardener. The hosts this week are Effie @ Food Daydreaming and Lindy @ Lindy Mechefske. I’ll also stop by Throwdown Thursday, Quinn of Dad What’s 4 Dinner and Alli from Tornadough host this blogging extravaganza. I’m bringing this to another round up party, Tasty Tuesday – it’s my first time there and should be fun! Today, I was presented with a small miracle, and I just had to add it on to this post and share it. I’ve been helping my folks in South Dakota through the summer and fall and came home to an overgrown, neglected yard and gardens. I was so bummed, but I glanced over to see one perfect rose on a very persnickity bush – in October, in Minnesota. This entry was posted in Click here for Fabulous Food Posts and tagged Cake, Chocolate, Chocolate Chips, cocoa, Desserts, Easy Recipe, Freezes Well, Frugal Hausfrau, Gourmet Magazine. Bookmark the permalink. I’ve only frozen it once because we had to leave town unexpectedly; I wrapped in plastic wrap and again in foil. Of course, we forgot about it, and it was just fine six months later – thawed overnight in the fridge. Hi, I really want to make this cake but only have a 9″ round pan. But it’s shallow, not a springform. Should I double the recipe? I don’t ever use a springform, just use parchment or wax paper on the bottom. I have not doubled it but have seen many reviewers who say they have. Since it is thin in an 8″ if I only had a nine, I think I would double it. Good luck and I hope you love it! I tried making this and could not get the sugar to dissolve. It stayed grainy. Used all the ingredients above, stirred sugar in gradually with a whisk. Hi Karen, thanks for pointing this out. I have two thoughts: first was the chocolate butter mixture still a little warm? You don’t want it steamy hot or it will cook the eggs, but I don’t let it cool down. The other is, I’m not sure if the sugar is supposed to stay grainy or not before it is baked. I know for most cakes, the sugar is supposed to be incorporated as it is beaten into creamed butter – the test is to run a bit between two fingers and if you no longer can feel the grains of sugar, you’re good to go. I honestly don’t think I’ve ever tested or thought about if the sugar is grainy and I think it doesn’t matter in this cake. That’s part of what makes it fudgy. I’ll try to make it this afternoon and check back with you, but I may not be able to get to it until tonight! How did the final cake turn out for you? Hey again, Karen – I did get a chance to make this again, but not until this evening – it’s in the oven right now. So the sugar – yes it stays grainy. No, it’s not a problem. You’d think I would have been able to remember – I don’t know how many times I’ve made this little cake – many, many times! 🙂 And now, I’m going to try to just have a sliver! So I made this cake last night. O.M.G. It was ridiculous- It’s sooooooooooooooo good!! WOW! this cake looks scary good!! So decadent! I need this in my life! Thank you for sharing on Tasty Tuesdays! Dina, it was my pleasure, and I hope you give it a try – it’s so easy! 🙂 It’s a little like cheating! It was fun to stop by and a wonderful party! And…. I agree with Elaine. That rose was there for a reason! You are so funny. This is the perfect cake for John and I. We love chocolate and it sounds delicious. I love non fussy! Maybe it’s perfect for Halloween? Gosh, yes! maybe with a dark glaze and some spider web piping! Or reverse! I promise you, if you make it, you will! It’s so easy, it’s dangerous! And I love the Thelma and Daphne references!! Well, being more of a Daphne myself, I just had to mention her! haha! I’d like to thinks so! Iknow it sounds a bit silly, but it raised my spirits and I looked at the whole day differently! This cake looks INSANELY GOOD. I was thinking about what your sister said about it being ugly and (while I think it looks lovely!) if you put the batter into individual ramekins and baked for a little less time and then sprinkled with powdered sugar or topped with ice cream, might you be able to serve to company? I love a good, moist chocolate cake. They are my favorite. I think they put vanilla cakes to shame. I’m so glad you posted this! I will try it soon. But, back to the cake. I have found a few things that can be done – It does look a bit better if baked a little longer. Regular old chocolate powder instead of dark does make it look a bit better. Both of those change the taste. Now, I have seen some people who put a layer of ganache or a thin coating of other chocolate frosting, but that might be a sin, and doesn’t really suit the style. I’ve made another, similar cake that recommended cutting out a circle of cardboard and pressing down on the cake to even it out before turning it out (probably a cook’s illustrated recipe – it sounds like them.) but all that is too fussy for this cake. Others have tried this in a spring form or a tart pan. In truth, in real life, although still ugly, when the cake is pulled out live and in person, it doesn’t seem quite so bad – of course there is anticipation and the smell…oh the smell of all that chocolate. But, when compared to so many of the gorgeous cakes we look at on the internet and in magazines, yeah, it lacks a bit in the looks department. I did come across another blogger (a much better photographer than myself) who managed to make this cake look good. She must have had great equipment, and fussed, photoshopped and managed to get “that one good piece.” While I had a momentary pang of jealousy, I then backed up and thought – oh my goodness, someone is going to make this for a party and find out it is actually ugly! Then they’ll bring it along, apologizing…and this is no cake to apologize for! !